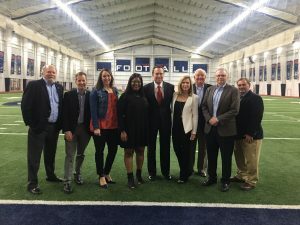 Todd Hoskins, Co-founder of My-Take, was invited to meet with the Ole Miss Center for Innovation and Entrepreneurship (CIE) board on Friday, October 22nd and answer some questions. Q: So, what is your tie to the University of Mississippi (Ole Miss) CIE? TH: I received my MBA from Ole Miss and was invited to attend the meeting based on my Entrepreneurial experience. As anyone who knows me can tell you, I have a strong attachment to the university, so I was eager to help in any way possible. Q: How is Ole Miss demonstrating their commitment to innovation and entrepreneurship? TH: The first step they’ve taken is to create a vision and culture that inspires and supports students who have entrepreneurial ambitions. Ole Miss is doing this through the academics, culture, and real-world experiences. Two of the biggest steps they’ve taken are to establish both a major and minor in Entrepreneurship. I’m very impressed with their commitment and progress. Q: Are there any other unique aspects of the CIE program? TH: The CIE has several great initiatives as part of the program. The Rebel Venture Capital Fund is an alumni-established, non-profit entity created to financially support student start-up businesses with seed money grants. It’s chartered as a 501c (3) and is separate from the university. Another great initiative is the LandShark Tank Pitch Competition that provides an opportunity for students to present their business concepts in front of a panel of judges. In addition to a chance to win, students also receive feedback from faculty and business people. Q: How are alumni and friends of the university getting involved with CIE? TH: Individuals can get involved in a variety of ways including judging competitions and providing feedback to students, the Entrepreneurship Speaker Series, hiring interns, mentoring, and gifts to the university.